So I’m actually kind of a terrible blogger. I’m completely haphazard with posts. No schedule or order of any kind around here! 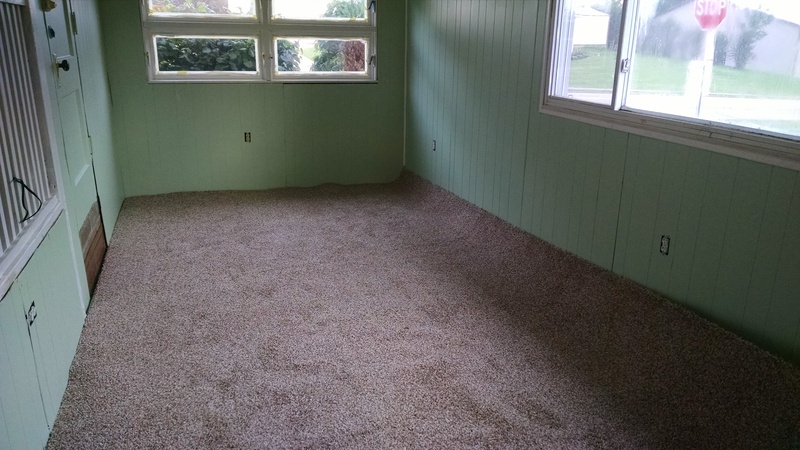 The biggest change since my last post is, of course, the carpet! We did indeed install it over the long weekend, and I am so happy. I hug my carpet almost every day. It’s so soft and fluffy!!!! 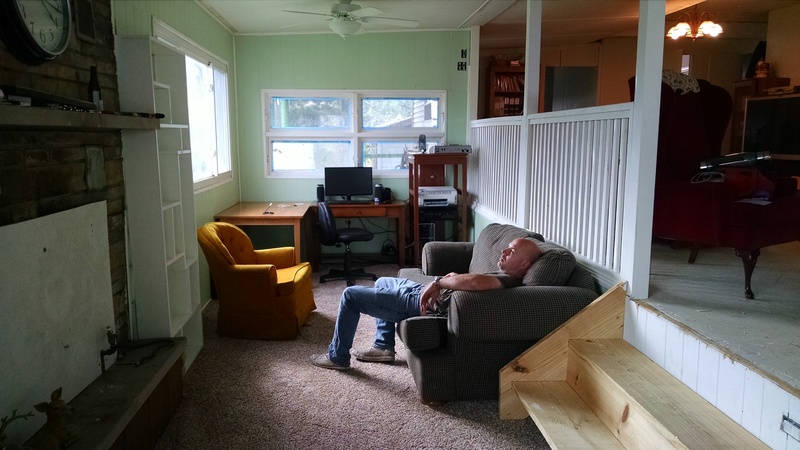 We installed it ourselves (I, of course, use “we” very loosely here), and it’s another project that would have been difficult/impossible without Pop’s help. 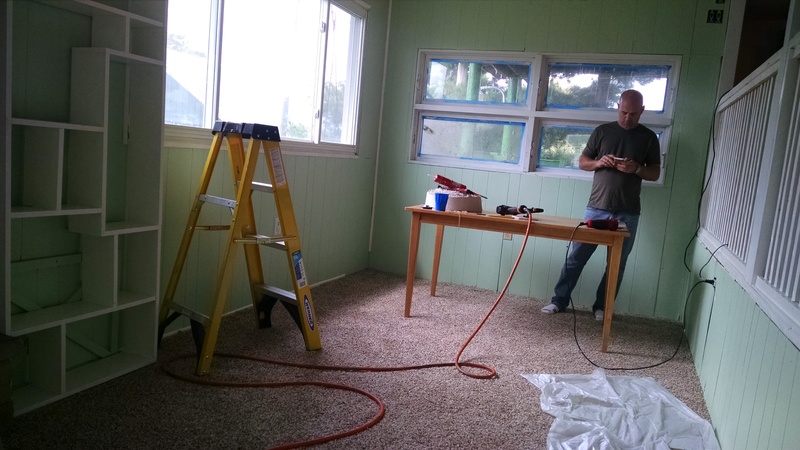 He had some tools that we needed and some experience putting carpet down, and that was invaluable. We bought this carpet off the roll, which means that we could only control the length, not the width. We needed 37’x9′, but ended up with a discounted 36.5’x12′ because it was the end of the roll. So, the first thing we had to do was cut off most of that extra 3′ of width. This was not an easy task. The carpet was heavy and unwieldy, we didn’t really know what we were doing, and we had almost no maneuvering room because our house was full of all of our stuff! We had to unroll a bit, cut, roll the cut parts, and unroll some more. See what I mean about no space??? We cut off about 2 1/2 feet, and then did the final trimming when we got the carpet laid out. 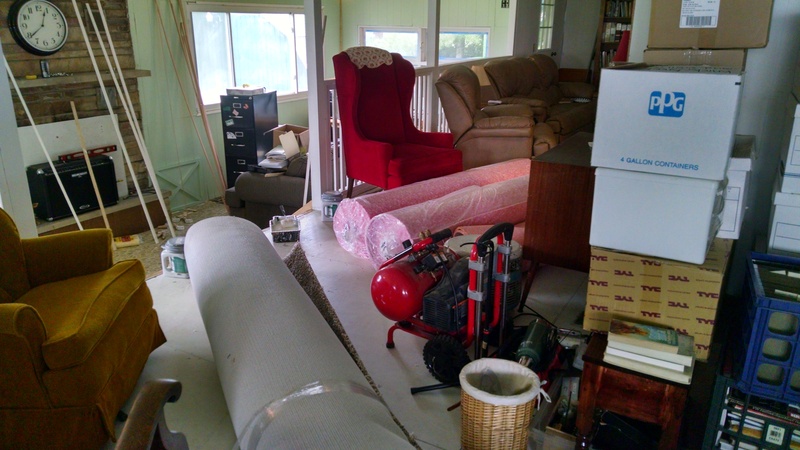 Next, we emptied out the lower room… mostly. 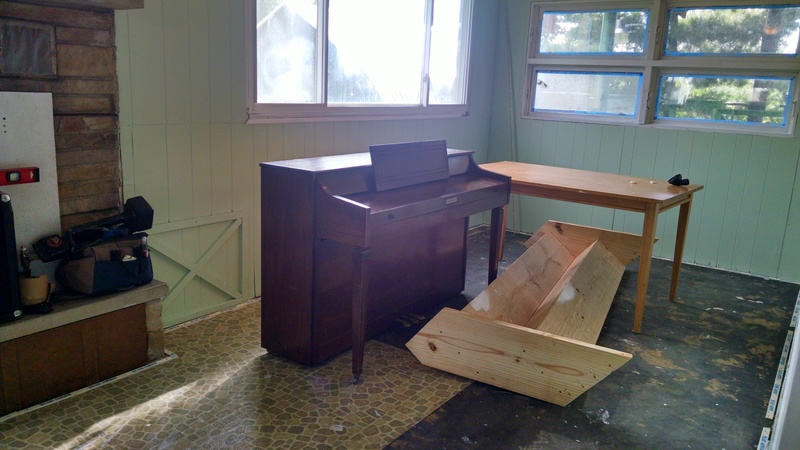 This piano, while not as heavy as the upright grand at my parents’ (which is my actual piano – this one is my mom’s), is still heavier than Tom, Pop, and I could lift out of the lower room. And there simply wasn’t any place to stow the table and stairs (which we unscrewed from the wall for the carpet installation) until we moved some of the carpet material into the room. It was sort of like one of those logic puzzles where you have to slide the pieces about in just the right order. I love having a piano, but it sure is a hassle to move about! After that, I vacuumed up the floor as best I could, so thankful that I was never going to have to look at that nasty black powdery stuff again! Then we started putting down the padding. For some reason, they gave us way more padding than we needed (although not quite enough for a double layer!). We upgraded a bit – it’s 8-pound padding instead of the usual 6, and it has a plastic coating on the top so that if something spills on the carpet, it doesn’t soak down all the way through the padding. 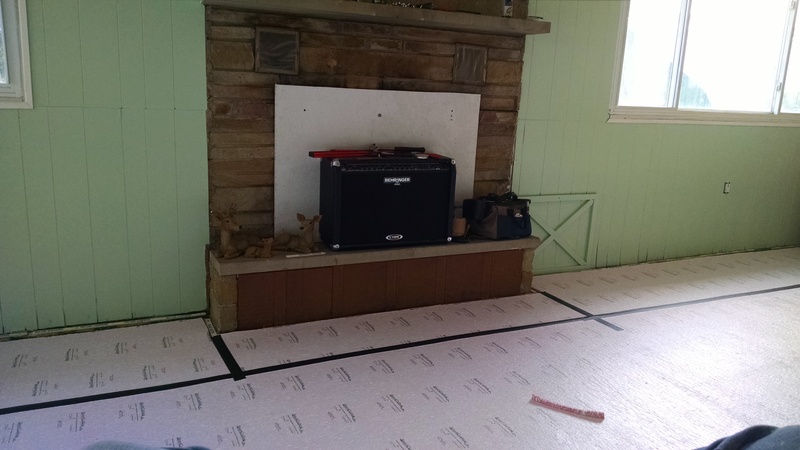 I didn’t get a picture of it specifically, but after putting down the padding, Tom and Pop installed the tack strips. You can kind of see one to the left of the fireplace in the picture above. We were installing them into rather crumbly concrete, so they weren’t all completely stable, but enough stuck to be helpful. Unfortunately, Lowes only had two choices – bundles of 12 strips for $6, or 100 for $15 (really?). 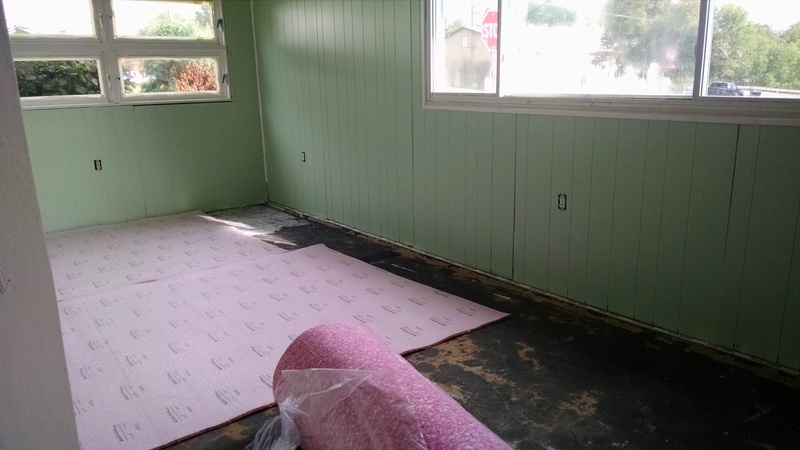 So now I have enough tack strips to carpet the rest of the house, which we probably aren’t going to do but…. Finally, it was time for the actual unrolling! Super heavy and hard to move around, but awesome nonetheless! I was beyond excited at this point. 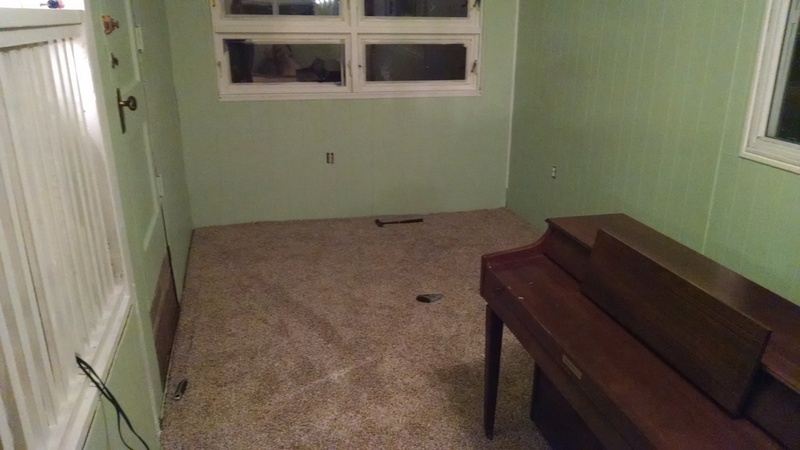 I’m easily excited about our remodeling projects, let’s be honest, but the carpet really was a big deal. It’s changed the entire house. After we got it in the basic location, Tom and Pop began to work the magic of trimming and stretching the carpet. Because some of the tack strips were very secure, this part was a little difficult at times, but they persevered. This way, we just had to lift the piano over the roll of carpet. 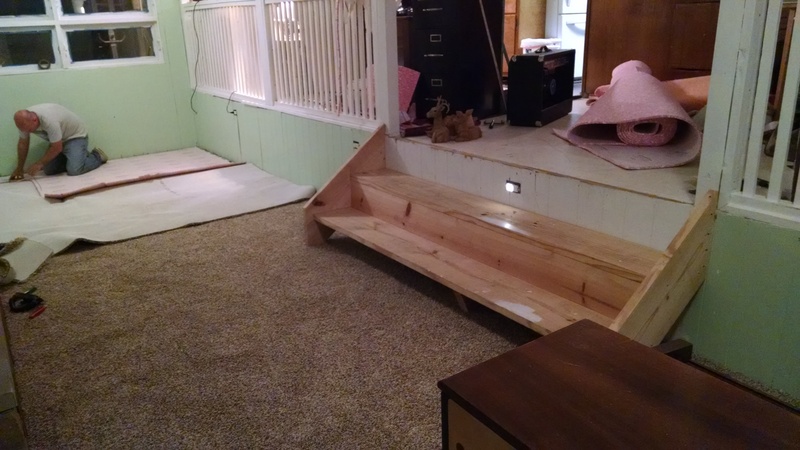 The other complication was the fact that our carpet was only 36.5′ and we needed 37′. The seam will be tucked under the table/desk that Tom’s going to build, and Pop had the stuff we needed to sort of iron the seam together. 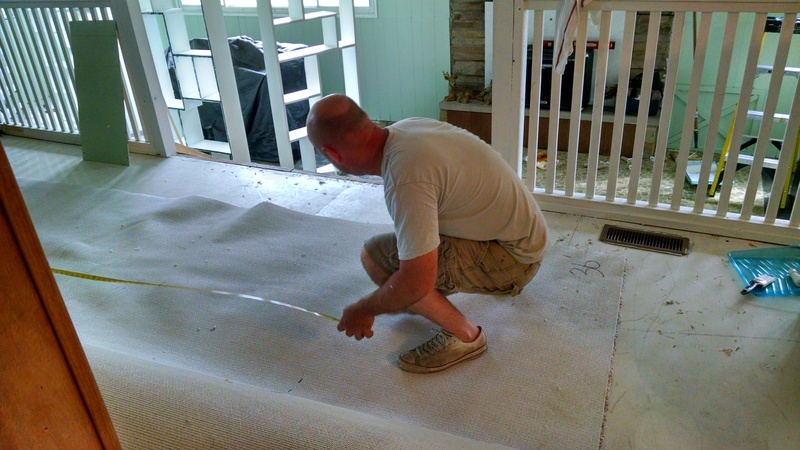 Here, Tom’s patching in the last of the padding, and measuring for our carpet seam. At the end of the day, I had beautiful carpet that I love. It’s soft and fluffy and happy and perfect. That all happened on Sunday. We spent most of Monday (Labor Day) moving things back into the lower room – mostly shelves and other furniture. Really excited about my white shelves against the green wall!!! We are really bad at relaxing holidays. Overall, the project went surprisingly well. There were still a few bumps in the carpet at first, but they’ve evened out and it looks really good. The lower room has gone from being a sort of catch-all storage area to someplace we actually like to sit and hang out. Things have been really busy at work, so I haven’t unpacked everything onto the shelves yet, but progress is being made. 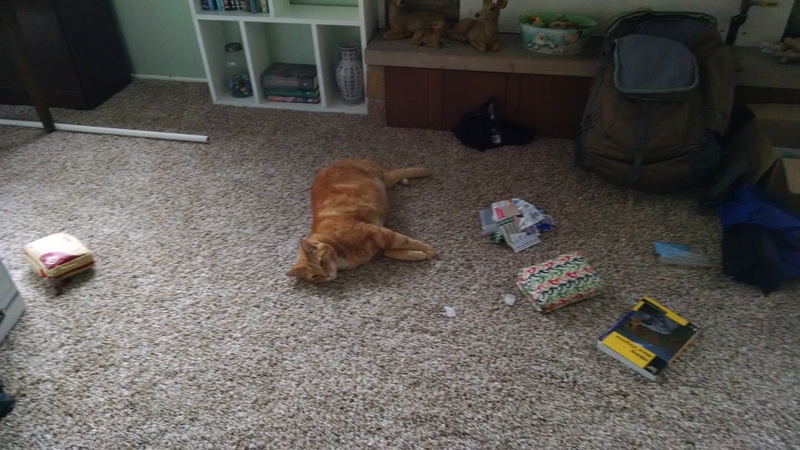 Clarence loves the carpet, too. Things are starting to settle into place. 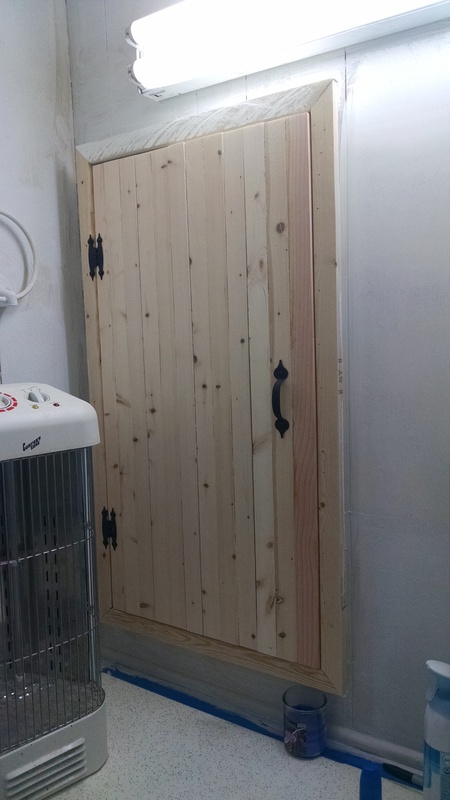 The other little project that Tom’s been working on is putting a door on the bathroom cabinet. You may remember that it’s a pass-through cabinet, with one side opening into the laundry room. The bathroom side still needed a door. Tom, with the help of his favorite kind of wood (strips of 2×4’s, of course!) created the most adorable little door you’d ever like to see. It will eventually get sanded and painted, but for now, it’s fully functional. Looking forward, our budget needs some recoup time, so the next couple of weekends will probably be moderate projects. 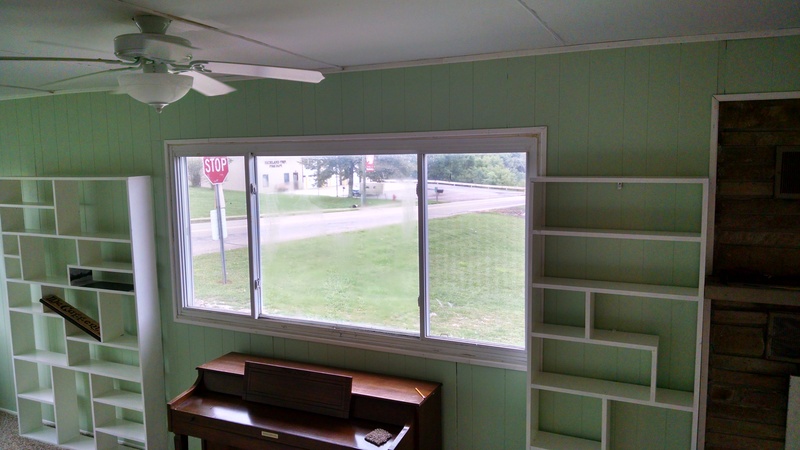 We’d like to get some more walls painted/trim up. Tom cut more trim last night that I’ve been sanding today, and I think we’re going to get the paint for the living room walls and also for my stairs tomorrow. 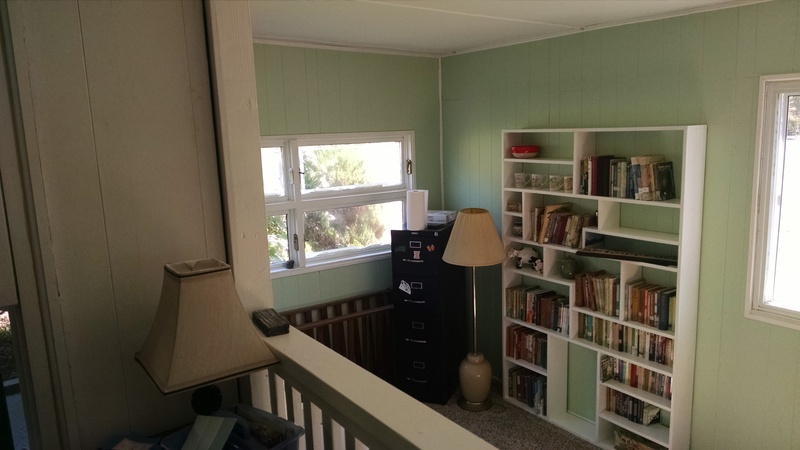 There are several random little projects, like finishing the shelves in the bathroom cupboard, designing and building Tom’s desk/table area, cutting a hole for the dryer vent (currently, it just goes out the window), and finishing out the tv stand in the bedroom. It’s nice to be past the emergency stage, though, and to just be able to work on these projects at our own pace and as we feel like it. The pressure is off, yet every new little thing that gets done makes life so much better.